The straight, ordered, linear roads of perfect recall we think of as memory more likely than not exist as a tangled mess of unspooled tape with twists, turns and dead ends aplenty. Providing visuals for the first single from Louis Barabbas’ solo album Gentle Songs of Ceaseless Horror, Director Paul Wright’s You Did This To Me takes a gruesome look at the desperation of loss and recall. DN invited Wright to take us inside the production of his unnerving music video. The project really began in 2014, November, if memory serves. I had emailed Debt records about working on anything with them as their roster was so strong. Louis and I met up (he’s one of the label’s founders) and discussed music film and everything in between. Nothing really happened, aside from meeting up a few more times discussing new bands and new films. Fast forward to July, 2015 and we finally set a project in motion for You Did This to Me. Straight away I had the idea of a man, tangled up in memories, struggling to deal with some sort of loss, but the video lacked something, some defining moment. It was only upon the realisation that I had an unopened email with a new version of the song did all the pieces finally fit together. The rousing Zimmeresque organs cried out for something really dramatic and the more I listened, the more I realised it had to be something tinged with horror. I wrote a full script and fired it off to Louis who then suggested the rather brilliant idea of the surgeon pulling ‘memories’ and goop from the back of his head. It gave the violence a point. So from there we shot over two days in a delightful park and a neighbour’s cellar on a Canon D Mark II using a 20mm Lomo Diana lens, but with a 50mm and 28mm Miranda for some of the closer shots. The crew was tiny. For the first day we had myself, Louis (acting of course) and Bryony Anderson as 1st AD. For the second day we had Louis’ label mates Biff Roxby (Surgeon) Felix Hagan (Nurse #1) and Dan Watkins (Nurse #2). We also had with us the wonderfully talented Martina Nie who grabbed production stills. They all turned up and were a little shocked (in a good way) by the set and detail we had gone to and put in some really unnerving performances. 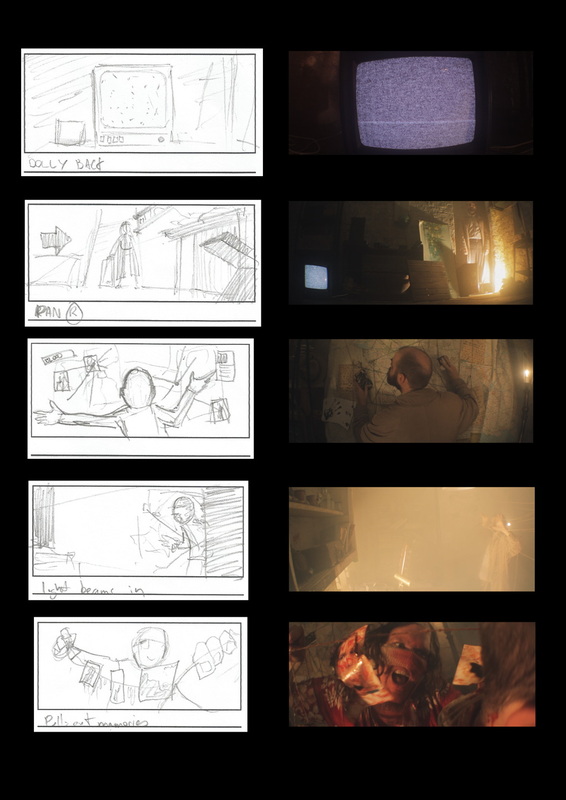 From shoot to finish was about two and a half weeks. The only shot that needed any vfx was the tv in the park at the end. I was all set to do it practically, but realised that the TV we used (my childhood portable TV borrowed from my parents) had no scart input. So had to break out some 3d tracking in an otherwise post-light project. Some fun trivia about the set. Vintage projectors and cameras are there, but lurking around. The photos are all from Louis’ past – places, band mates, amongst lyrics and old note books and lyric books. The reels of film hanging from the ceiling are from a trailer for Sherlock Holmes 2, which shared a set with The Bedlam Six video Mother. So lots of connections which is nice for a video seemingly preoccupied with memory. From quite a laid back start this project turned around in no time, and I couldn’t be prouder of the results. Hopefully this isn’t the end for ‘String Man’. Glad you liked it James. Yes it’s impressive what Paul pulled off with just a basement, string and oodles of blood.